One of the challenges during the winter season is finding the time to practice wellness. I like to find simple things that help me incorporate day-to-day wellness habits into my life. Opening a few small bottles of therapeutic aromatherapy essential oils and creating some blends that not only smell great but that also provide therapeutic benefits is a great addition to the winter wellness toolbox. Aromatherapy essential oil blends require little preparation other than choosing your oils, blending them together, and actually using them on a daily basis! Here are two of my favorite easy aromatherapy essential oil blends you can use for winter wellness support (check the end of this post for a fantastic Stress-less Holiday Support Blend). Note you can adjust the quantities recommended and make a larger or smaller quantity; just keep the ratio the same. Blend aromatherapy essential oils and shake well. You can use this blend in a number of ways: in a diffuser, massage it directly onto your stomach with clockwise stroking motion, or add 3 drops to your cup of tea. See other ways to use your blend below. Mix all ingredients. To prepare as an inhalation, add 3 teaspoons to 6 cups of boiling water. This mixture can also be added to bath water or to footbaths. Use 3 drops in the bath or 1-2 drops in a footbath. It is also an effective formula to use in a nasal inhaler. Here's a bonus aromatherapy essential oil blend to get you into the spirit of the season. Enjoy! Blend and massage into scalp and forehead and back of the neck for a sedative and headache support. 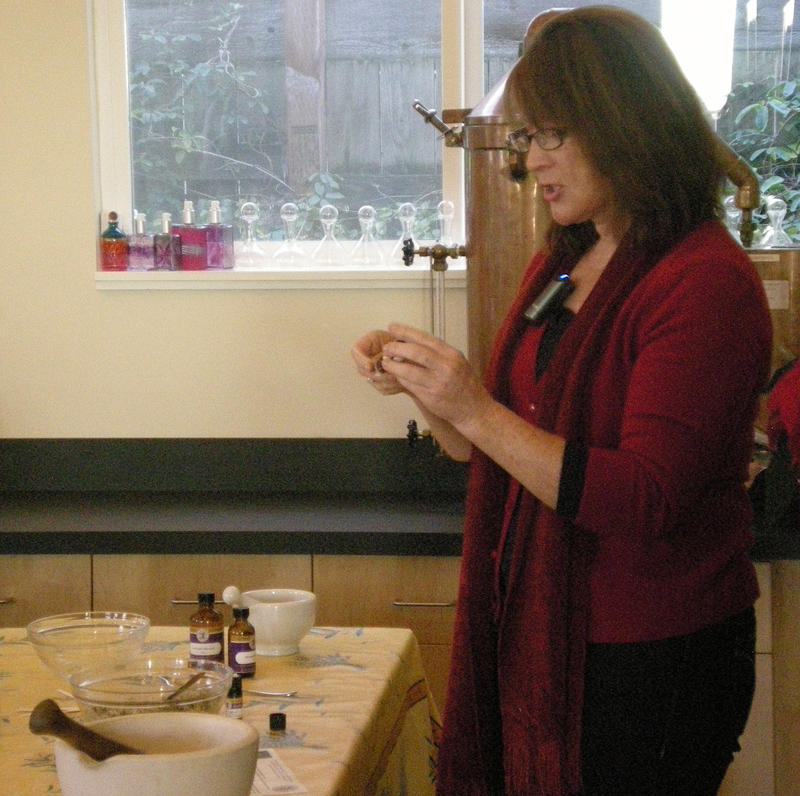 Image credit: ACHS President Dorene Petersen demonstrating how to make essential oil blends at the ACHS Winter Open House 2009. Photograph by ACHS Staff. Note, this information has not been reviewed by the FDA. This information has been presented for educational purposes only and is not intended to treat, diagnose, cure, or prevent disease. Always consult with your primary care physician, naturopathic doctor, and/or Registered Aromatherapist before making any significant changes to your health and wellness routine.